Published by the Bozeman Daily Chronicle on Thursday, January 25, 2018. Written by Katheryn Houghton. Montana’s Medicaid program requirements are blocking hepatitis C patients from treatment, according to a national report released recently. An estimated 15,000 people in the state are living with hepatitis C, according to the National Viral Hepatitis Roundtable. The illness kills more people in the U.S. than any other infectious disease. The report, Hepatitis C: State of Medicaid Access — created by the roundtable and the Center for Health Law and Policy Innovation of Harvard Law School — grades all 50 state Medicaid programs according to access to treatments for the disease. “Montana’s ‘F’ grade comes as no surprise to those of us who’ve seen first-hand the hoops our state’s Medicaid patients must jump through to access a cure for hepatitis C,” Geyer said. Montana’s program, Passport to Health, requires hepatitis C patients to demonstrate severe liver damage, six months of sobriety and a prescription from a specialist — which can be costly and difficult to find — before they can access treatment. According to the report, more than 1,000 cases of hepatitis C are reported in Montana every year, many from the baby boomer generation. Not every person diagnosed relies on Medicaid for coverage. Jon Ebelt, a spokesperson with the state health department, said since 2014, Montana has approved 266 requests for Medicaid coverage of hepatitis C treatment. Sheila Hogan, the director of Montana’s state health department, said in a statement Thursday afternoon that the high cost of prescriptions drugs, like medications for hepatitis C, is one of the major hurdles to deliver health care. “This challenge is reflected in the grade Montana and more than half of the states in this report received. If prescription drug costs were lower, more Montanans could get this treatment for Hepatitis C,” Hogan said. Montana was one of five places marked with a failing grade. Dr. Mark Winton, an infectious disease specialist with Bozeman Health, said the state’s fibrosis score system isn’t “in line with current medical practices.” “Anything that delays treatment increases the risk of complications,” he said. Robert Greenwald, clinical professor of law at Harvard Law School and the director of the school’s health law center, agreed that the state’s rules around patient sobriety is “medically unfounded” and said it puts others at risk. “Even though the opioid crisis is exacerbating the hepatitis C epidemic, Montana is preventing patients who have used drugs in the past six months, the population most likely to spread this highly communicable disease, from accessing a cure,” Greenwald said. The report authors call for Montana to remove its restrictions around liver damage, sobriety and where patients have to go for prescriptions. They also ask the state to maintain transparency around criteria of hepatitis coverage. Originally published by politico.com on Wednesday, January 25, 2018. Written by Helena Bottemiller Evich. A small bipartisan working group focused on using nutrition to improve the nation’s health formally launched in the House on Wednesday, just in time for the 2018 farm bill cycle. The Food is Medicine Working Group, which is part of the House Hunger Caucus, is led by a mix of New England Democrats and Kansas Republicans: Reps. Jim McGovern (D-Mass. ), Lynn Jenkins (R-Kan.), Chellie Pingree (D-Maine) and Roger Marshall (R-Kan.). The group aims to emphasize the link between nutrition programs and health outcomes — a small step toward better aligning agriculture and health policy. “My hope for this working group is that we’re able to explore our nation’s anti-hunger safety net and to discuss ways to make it even better,” McGovern said Wednesday at a standing-room-only briefing on Capitol Hill. McGovern listed several policies the group might take up, including incentivizing the purchase of fruits and vegetables, bolstering Supplemental Nutrition Assistance Program education, looking at “medically tailored” meals to help people fight disease, and exploring programs that allow doctors to give their patients prescriptions for produce instead of pharmaceutical drugs. Staff on both sides of the aisle attended the briefing, along with food and ag policy leaders from Tufts University, the George Washington University Food Institute, Harvard Law School, Feeding America, the Partnership for a Healthier America and the food industry. It was notable in its overarching theme of bipartisanship. Marshall, an OB-GYN who said he’s delivered an average of one baby per day over the course of his career, went on to talk about the importance of proper nutrition for pregnant women, offering strong praise for the WIC program, which supports pregnant women, infants and young children. “Of all the programs that I’ve seen work great at the federal and state level, in the real world, both WIC and [the Maternal & Infant Care Program] do a great job of helping educate women of what they should be eating,” he said. Published by Health Affairs Blog on Thursday, January 18, 2018. Written by Robert Greenwald, Faculty Director for CHLPI and Judith Solomon, Vice President for Health Policy at the Center on Budget and Policy Priorities. For more than 50 years, Medicaid has been our nation’s health care safety net. Medicaid allows our lowest-income, sickest, and often most vulnerable populations to get care and treatment, and supports the health of more than 68 million Americans today. As an entitlement program, Medicaid grows to meet demand: There is no such thing as a waiting list. This vital health program found itself under fire in 2017, and while there were no major reductions in funding or enrollment, it is far from safe in 2018. Whether by new legislation or actions the Trump administration may take, the threats to Medicaid are not going away anytime soon. Throughout 2017, Republicans tried unsuccessfully to roll back the Affordable Care Act (ACA), including the law’s expansion of Medicaid. Underpinning each effort was the oft-stated belief, held by Republican leadership, that the expansion was a disastrous move that extended coverage to more than 12 million able-bodied people who should not be getting health insurance from the government. While these unsuccessful efforts were commonly referred to as attempts to “repeal and replace the ACA,” every bill that gained any traction in 2017 went far beyond repealing only the ACA’s Medicaid expansion. The proposals also included plans to fundamentally alter the way in which the traditional Medicaid program is structured and paid for. Medicaid is a partnership between each state and the federal government. Both pay a share of the cost of caring for a state’s enrollees. Under this system, as a state’s costs rise, the federal government’s contribution grows to keep pace. Each of the major “repeal and replace” bills advanced in 2017 would have turned away from this longstanding partnership and placed a cap on the federal government’s contribution. Under these proposals, once the federal funding cap was reached any further costs of providing Medicaid-based care would be solely borne by the state. Capped funding inherently shifts responsibilities for financing Medicaid to states, particularly if the amount of funding allocated is insufficient. It represents an enormous shift away from a strong federal-state partnership. Capped funding dramatically reduces states’ capacity to respond to unexpected Medicaid program costs, such as those created by economic downturns, natural disasters, and public health epidemics. States are required to have balanced budgets, unlike the federal government, and will likely need to cut funding at the time when people need Medicaid the most. What we have seen from congressional proposals in 2017, and will likely continue to see in the year ahead, is that each major capped funding proposal cut hundreds of billions in federal funding from the Medicaid program over time. These plans promise “additional flexibility” for states to better serve their particular beneficiaries. However, what is clear is that the only flexibility offered by these bills is the flexibility to cut either eligibility, benefits, payments to physicians, or some combination of the three. Flexibility without adequate funding is meaningless. Congress is not the only place where Medicaid is under threat. The Trump administration is also considering policies that could dramatically alter current health care service delivery. Section 1115 of the Social Security Act, for example, gives the secretary of the Department of Health and Human Services (HHS) discretion to waive certain federal Medicaid requirements to allow states to conduct “experimental, pilot, or demonstration projects” in their Medicaid programs. The secretary must find that the demonstration is likely to promote the objectives of the Medicaid program, chiefly to provide medical assistance to low-income individuals. Under the Obama administration, HHS did not approve 1115 requests to implement policies that would have the effect of reducing enrollment, finding that these policies did not advance Medicaid’s objectives. However, the Trump administration is likely to change tack soon and approve pending state requests to implement work requirements as well as other potentially restrictive policies such as drug screening, time-limited eligibility, and premium payments with disenrollment and lockouts for nonpayment. It is difficult to imagine how these policies promote the objectives of the Medicaid program. Imposing work requirements ignores data showing that the majority (nearly eight in 10) of Medicaid adults already work or live in working families. Work requirements add more paperwork, increasing burdens for both Medicaid beneficiaries and administrators. Even if some individuals, such as those living with a disability, are exempted from the work requirement, experience with these requirements in other government programs suggests that exemptions are often incorrectly applied, resulting in sanctions imposed on those who are not subject to the requirement and an overall decline in assistance provided. Many of the pending waiver provisions would cause a significant number of people to lose their health coverage, undermining Medicaid’s core purpose. While it follows that HHS should reject such proposals, the Centers for Medicare and Medicaid Services has released guidance inviting states to request work requirement waivers, and has approved the program’s first work requirement in Kentucky. As work requirements and other restrictive proposals are approved, advocates are poised to challenge such policies, using litigation if necessary to establish that such proposals violate federal law for failing to advance the goals of the Medicaid program. For a half century, we’ve seen that Medicaid both improves individual health and patient satisfaction, and supports voluntary work and growth in the economy. Despite these proven benefits, the Trump administration and congressional leadership continue to propose policies that would drastically scale back Medicaid. Whether by legislation or administrative action, it is clear that the future of Medicaid is far from certain. 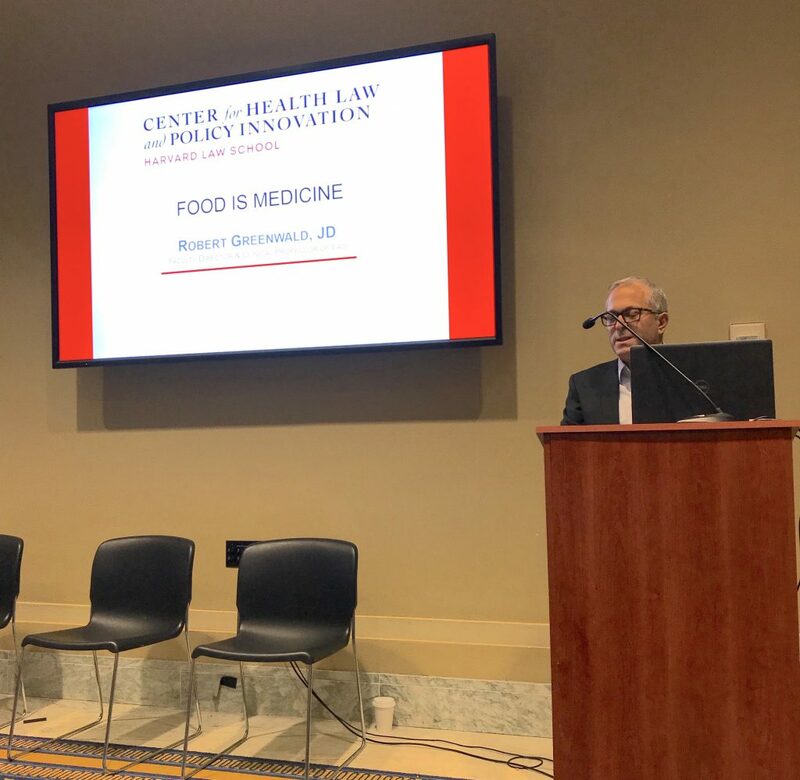 On January 17, 2018, CHLPI’s Faculty Director, Robert Greenwald, spoke at the Food is Medicine: Addressing Hunger as a Health Issue panel discussion. The briefing kicked off the launch of a new bipartisan Food is Medicine Working Group within the House Hunger Caucus. to bring into focus the impacts of hunger on our nation’s health. Congress members Jim McGovern, Lynn Jenkins, Chellie Pingree, and Dr. Roger Marshall were all on hand to lend their thoughts on the importance of the Food is Medicine movement. View a recording of the congressional briefing on Facebook. View CHLPI’s slides from the congressional briefing. Andy Fisher came to Harvard Law School on December 5, 2017 for a book talk, sponsored by Harvard Law School Food Law and Policy Clinic and the Harvard Food Law Society. In his new book, Big Hunger: The Unholy Alliance Between Corporate America and Anti-Hunger Groups, long time food activist, Andy Fisher demonstrates the existence of a hunger industrial complex—the web of relationships between corporations and anti-hunger groups that perpetuate hunger rather than eliminate it. Big Hunger reveals the damage caused by this hunger-industrial complex to the wellbeing and dignity of the poor, and offers a new vision to eliminate hunger through a focus on public health, economic justice and local economies. Could 2018 be a Big Year for Food Recovery Legislation? Originally published by Waste360 on December 21, 2017. Written by Arlene Karidis. The new year could be monumental for H.R. 3444—The Food Recovery Act, its supporters hope, if efforts to tie some provisions to the 2018 discussions on the farm bill are successful. Omnibus legislation which covers much of U.S. food and agriculture policy comes up for passage in Congress every five years. Some legislators are attempting to add food recovery efforts into that larger bill. The largest pieces of H.R. 3444 call for research into new technologies and approaches for food waste prevention, date labeling and a government food recovery liaison to coordinate efforts across federal agencies. The act also pushes for support for composting under U.S. Department of Agriculture (USDA) programs. Rep. Chellie Pingree, D-Maine, who introduced the act with Sen. Richard Blumenthal, D-Conn., started looking closer at issues around food waste after hearing a presentation on the topic. The research provision seeks funding for additional studies around food waste and its sources and to expand research into food preservation technologies. The food date labeling provision would standardize and differentiate safety dates from quality dates. It is the provision for a government food recovery liaison that especially interests Nicole Civita, professor of agriculture and food law at the University of Arkansas in Fayetteville. She consulted with Pingree’s office on the original bill. “Having someone coordinate food waste reduction efforts across federal agencies is important because so many agencies are implicated in both the problem and solutions,” Civita says. The Environmental Protection Agency focuses on environmental impact and initiatives. The USDA focuses on food waste and food loss. The Food and Drug Administration has its role in labeling. H.R. 3444 supporters want to require companies that contract with the federal government to donate surplus food to Also, they push for food service providers who submit bids for government jobs to be expected to include in their proposal how they will deal with surplus waste food. “I am suggesting it should be built into these companies’ responsibilities to not shift the burden and cost of food waste to taxpayers,” says Pingree. She believes opportunities could come from food waste management policy, and cites two processes as an example. There are still unresolved issues. For instance, there is a need to better understand what’s driving waste-generating decisions in order to determine relevance of the date label. The proposed act calls for a quality date on any food, which is “best if used by.” And it calls for safety dates, indicated by “used by,” on ready to eat, perishable products. But having uniform date labels is a critical component, especially considering that people travel and since food is sold across state lines. “I want to know dates have the same meaning everywhere to decrease confusion,” says Civita. The most recent attempt to move the bill at the end of 2015 resulted in getting pieces attached, including a permanent, enhanced tax deduction for food donation. Originally published by Vice on December 21, 2017. Written by Sony Salzman. As a liver disease doctor in Chicago, Illinois, Nancy Reau treats patients with hepatitis C, a viral infection that kills more people in the United States than 60 other infectious diseases combined, including HIV. Her practice has changed dramatically since 2013, when a flurry of miracle “cures” for hepatitis C were approved. Since then, Reau has successfully treated a majority of her hepatitis C-positive patients. However, Reau still has about 30 patients who are waiting for treatment. These patients have one trait in common—they’re covered by Medicaid. Across the country, Medicaid programs continue to triage curative treatment, even as most other insurance providers have adopted a treat-all approach. Some Medicaid restrictions include sobriety tests and proof of extensive liver damage, which run counter to medical consensus. Treatment denial “is a hard message for patients to stomach, especially a patient who has finally invested in taking care of themselves,” Raeu says. Often, she adds, “they fall out of the system.” For many state Medicaid programs, restricting access softens the financial blow of expensive hepatitis C cures. But for doctors, these restrictions are a nightmare, as they block access for their most vulnerable patients. In recent years, the price of hepatitis C medications has dropped dramatically, yet more than half of state Medicaid programs were given a “D” or an “F” in recent report card compiled by Harvard’s Center for Health Law and Policy Innovation (CHLPI). With this report card in hand, lawyers at CHLPI and other advocacy groups have a new weapon in their legal battle on behalf of low-income people seeking a cure for hepatitis C.
The fracas over hepatitis C medication began in 2013 when the first curative treatment, Sovaldi, was priced at a headline-grabbing $1,000 per pill, prompting outcry from public and private insurance programs alike. Over time, however, market competition slashed wholesale prices and behind-closed-door negotiations between pharmaceutical companies and insurance providers lowered the real cost even further. Today, treatment restrictions have been lifted by most insurance providers, and even by Medicare, a federally-funded program for the elderly. In part, that’s because number crunching revealed that treatment is cost-effective in the long run. But Medicaid, a program designed for the poor, is different. Medicaid programs rely on budget allotments from policy makers in Washington DC, making them highly sensitive to short-term expenses. One analysis found that two hepatitis C drugs—Sovaldi and Harvoni—comprised nearly 5 percent of the total budget for drug expenditures in 2015. However, since 2015, six new drugs have been approved at dramatic discounts. One such drug, Mavyret, was priced at $26,400, a 72 percent discount to Harvoni’s wholesale price. In theory, that means the net cost of treating a Medicaid patient with HCV would go down, according to Anna Kaltenboeck, program director at the Center for Health Policy and Outcomes, Memorial Sloan Kettering Cancer Center, and member of the Drug Pricing Lab team. For Reau, the dramatic price drop, but relatively unchanged policies means ongoing treatment restrictions have “nothing to do with price.” Instead, she says, they’re about stigma, as hepatitis C is associated with injection drug use. That’s part of the argument lawyers are making in a growing number of lawsuits levied against state Medicaid programs across the country. “I think states are hiding behind cost at this point,” says Phil Waters, clinical fellow at Harvard’s CHLPI. Regardless of budget considerations, Medicaid’s restrictions are illegal, Waters argues. In 2015, the Centers for Medicare & Medicaid Services warned states that treatment restrictions violated federal rules. A spokesperson for the National Association of Medicaid Directors did not respond to request for comment. Over the past several years, litigation has been initiated in Indiana, Washington, Colorado, and Missouri specifically on the Medicaid issue, Waters says. In Washington and Colorado, judges sided with patients, forcing Medicaid programs to drop treatment restrictions. Facing public pressure and mounting lawsuits, some states have voluntarily eased restrictions, he says. Today, the people being infected with hepatitis C are young, injection drug users. With a cure in hand, countries like Australia and Georgia are well on their way to eradicating hepatitis C by targeting high-risk populations. Meanwhile, the booming opioid addiction crisis has contributed to a three-foldincrease in the number of new infections in the United States. Although most of the 3.5 million Americans with hepatitis C are members of so-called “Baby Boomer Birth Cohort”—a generation of people who were infected before the virus was discovered in 1989—hepatitis C is spreading rapidly among 20-29-year-olds. With current treatment restrictions in place, “you are just building your next birth cohort,” Reau says.